Looking for an educational gift for the traveler, child, or adult? Get the GETLIFEBASICS ILLUMINATED GLOBE! The perfect tool that teaches about our world & universe. What makes the GETLIFEBASICS ILLUMINATED GLOBE special? 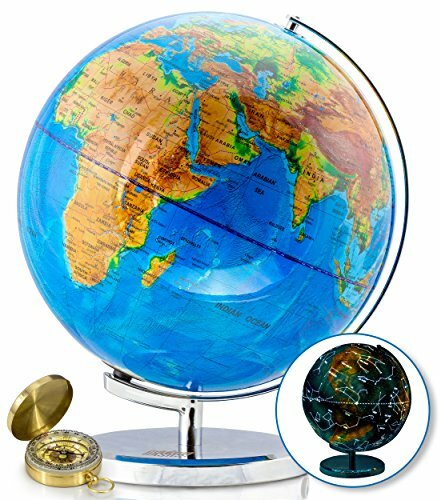 The GETLIFEBASICS ILLUMINATED GLOBE is the only 13” globe available. This 2 in 1 Globe is geographically & astronomically correct. Perfect for children, teenagers, or adults, it is universal. By day, it shows land boundaries, oceans, lakes, rivers, capitals, and major cities. At night, it displays the star's Latin and common name in the southern and northern hemispheres. This fun, educational product makes learning exciting & informative. Get World & Universe Educated! If you have any questions about this product by GetLifeBasics, contact us by completing and submitting the form below. If you are looking for a specif part number, please include it with your message.